Found 7 file extension associations related to Lotus Word Pro and 6 file formats developed specifically for use with Lotus Word Pro. Lotus Word Pro increases word processing productivity for end users by providing the most advanced technology in the areas of Internet publishing, file compatibility and speech recognition. Additionally, Word Pro offers users a number of tools that allow them to complete tasks more efficiently and effectively. Via Voice Gold Integration: ViaVoice Gold for Word Pro allows users to dictate text directly into Word Pro and read documents back to users. ViaVoice also accepts speech commands, enabling users to navigate menus and access features. Compatibility: Word Pro now provides unparalleled file compatibility with Microsoft Word and Corel WordPerfect, as well as all previous versions of Word Pro and AmiPro. Alternate menu option: Word and WordPerfect users can easily migrate to Word Pro through the use of the Alternate Menu Option. 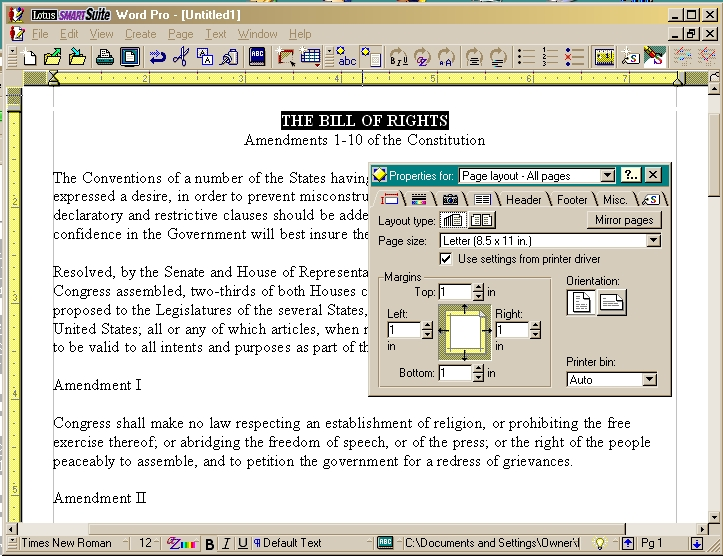 Word Pro users can replace the Word Pro menu with the menu layouts from Word, WordPerfect or Ami Pro. Helpful Menu Finder allows users to enter a Word, WordPerfect or AmiPro menu command, and Menu Finder delivers the corresponding Word Pro command and instructions. Page menu: Word Pro's page menu can quickly and easily access commonly used features such as Page Breaks, Page Layouts, Orientation, Margins, Headers and Footers. Word Pro also displays a Header/Footer toolbar allowing users to insert fields and align content. Click Here Blocks: Word Pro users can fill in content once; repeating Click Here Blocks will automatically repeat the text throughout the document. Click Here Blocks can be easily created and edited in a central Click Here Block management tool. TeamSecurity: Word Pro provides security that protects original documents from unauthorized edits by allowing reviewers to annotate in comment notes only. Graphic integration: Word Pro lets users flow text around graphics and both sides of any frame. Word Pro can also tile or center graphics in a frame or table cell, as well as rotate bitmap graphics in one degree increments. Internet publishing: Word Pro Release 9.8 offers users a number of high-fidelity Web publishing formats, including enhanced HTML. HTML Publishing Assistant: Word Pro HTML Export Assistant includes options for exporting headers, footers, footnotes, divisions and sections as separate files (including navigation links), Tables of Contents, and user-defined URLs. Web authoring toolbar provides access to common publishing tasks, such as animated progress display, and provides the ability to stop loading a page or to reload a page. SmartMasters work faster for HTML publishing and common daily tasks such as providing news, product information and phone lists. Hyperlinking: Hyperlinks can easily be created in documents through a shared hyperlink dialog box. Word Pro automatically converts URLs to hyperlinks. Word Pro Release 9.8 is sold as part of SmartSuite Release 9.8. The Lotus Word Pro software seems to be old or discontinued. If you need more information please contact the developers of Lotus Word Pro (IBM), or check out their product website.